Exploring one of the most controversial and provocative positions in the history of sport, ‘Ice Guardians’ journeys into the lives of those who perform what is undoubtedly the toughest job within the National Hockey League today, the enforcer. Very few understand this position and even fewer appreciate what is involved in becoming one. It’s a punishing profession unlike any other, holding little mercy for its candidates on or off the ice. Born out of self policing a game where 200 pound men fly towards each other on metal blades with sticks, the role now finds itself facing the scrutiny of national newspapers, on-line blogs and TV news casts. Due to its violent nature, it has drawn opinions from both fans and critics alike. But what do we really know? What led to its spectacular rise? What purpose does it serve in the eyes of its beholders and what drives them forward in the face of adversity? 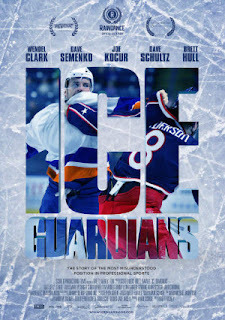 Ice Guardians steps beyond the hype and heads directly to the source of the debate… the players themselves. Through their eyes, tough exteriors are shed to reveal the humanity behind a role that struggles to maintain its existence. Cast: Kelly Chase, Jay Baruchel, Dave "The Hammer" Schultz, Clark Gillies, Dave Semenko.